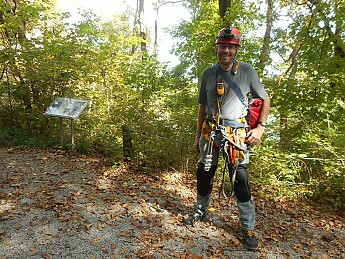 The Digger Cave Harness is a low-cost, no frills caving harness that does the job it is suppose to do. 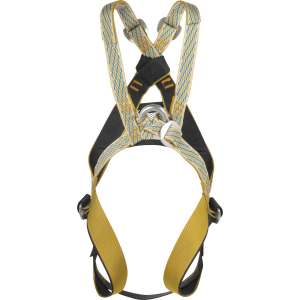 While it does not carry the marketing power of Petzl, there are several features that make this harness worth considering. 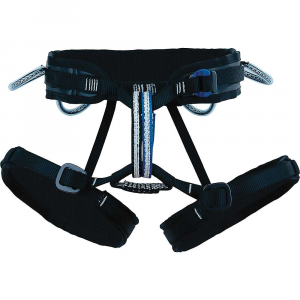 The function of a cave harness necessitates a different design from a traditional climbing harness. While rock climbers are ascending a rock face, primarily relying on the harness to catch them in a fall, cavers are actually climbing the rope, being fully committed to the harness during the descent and return to the surface (See pic #1.). harness in a rope walker set up. 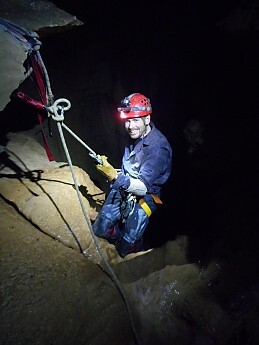 Because ascending a rope via mechanical ascenders involves a limited range of motion (the caver's own height), the attachment point for a cave harness needs to be much lower than a traditional climbing harness. Where a climbing harness' belay loop is at the navel, a cave harness' attachment point is below the top of the hip bones (See pic #2.). 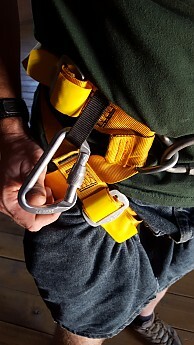 Additionally, the normal webbing belay loop is replaced with a steel or aluminum maillon. The reason for this is two-fold: 1) In a sit/stand ascent, the caver is seeking to eliminate as much play in the system as possible to make each step more efficient (For this reason, cavers also you static/low-stretch rope, rather than traditional dynamic/high-stretch climbing rope. ), and 2) Cavers have much more equipment using the attachment point than a rock climber (See pic #3.). 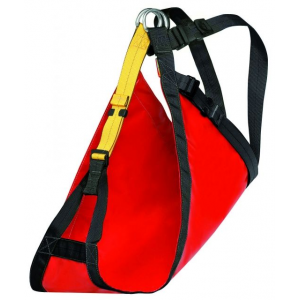 Finally, because one is often squeezing through tight passages with jagged rocks, caving harnesses are designed to have a minimalist profile and be abrasion resistant. They are not padded to avoid having padding soaking up water—a soaking wet harness is much more uncomfortable than an unpadded harness. The harness does a good job balancing price with functionality. There are higher priced models that I feel are more about name recognition than simply quality (I feel this way about The North Face products and John Deere lawn mowers!). There are cheaper models that work well, but lack some of the features offered. 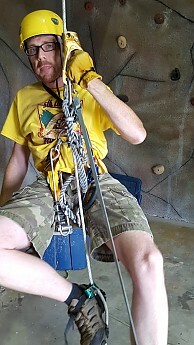 Some cave harnesses forgo gear loops altogether—the less hanging off of your harness, the less chance of getting hung up. 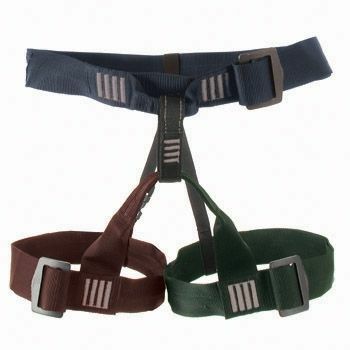 The Digger harness balances this by providing a minimalist gear loop on each side. 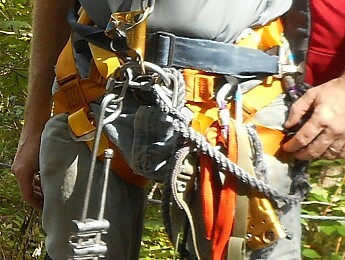 A caver can then choose to clip in a spare carabiner to have a larger “loop” to hang gear from (See Pic #4.). to be hung off the 'biner. When I was new to vertical caving, an old timer gave me this advice, “Never cave with someone too arrogant to let you double check their harness.” This means, you always have someone make sure you doubled-back your harness straps. A nice feature of the Digger harness are small pieces of abrasion-resistant vinyl that tuck into the buckles after straps are doubled-back. The primary purpose of these pieces are to provide protection to the straps against sharp rocks. 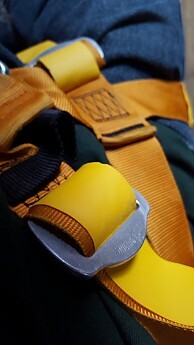 However, because they cannot be used unless the buckle is doubled-back properly, they provide a means of instantly knowing if the harness is safe to use (See Pics #5 & #6.). 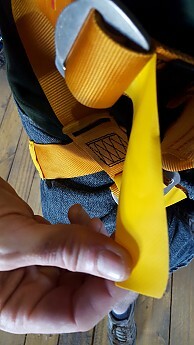 In addition to the vinyl tabs mentioned above, vinyl sleeves are sewn around both legs, fully covering the portion of the harness that is being rubbed the most from the sit/stand motion of the ascent (See Pic #7.). abrasion-resistant vinyl tabs and sleeves. 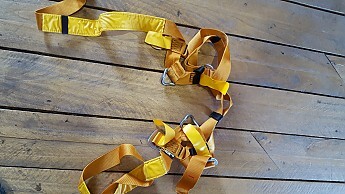 This is a one-size-fits-most harness, and that leaves a lot of leftover tail at the waist and legs (See Pic #8.). 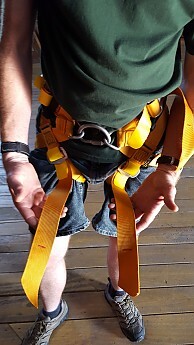 Honestly, I do not see how anyone big enough to fill out this harness would ever be able to use it—rope ascension is not for the average XL-sized person. 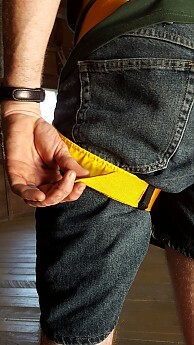 While the simple solution might be to just cut off the excess webbing, those who follow my exploits know I have lost 46 lbs in the last 18 months, and I do not want to make any permanent modifications to any of my gear in case I put some of that weight back on. 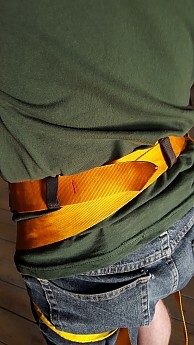 So as a non-permanent modification, I removed elastic keeper bands from a retired climbing harness and have found a way to manage the excess nicely (See Pics #9 & #10.). Pic 8: Lots of tail on the straps. keep the tails out of my way. The Digger Cave Harness has served me well underground for more than a year, and I hope to have many more adventures with it in the year ahead. Digger Cave Harness near the entrance of a Georgia Pit. 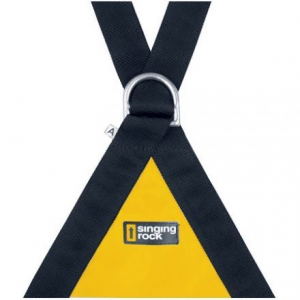 This harness is from Singing Rock, not CMI. It is similar to the CMI Cavemaster. I have been using this harness since it became available in the U.S. I also own the CMI Cavemaster. 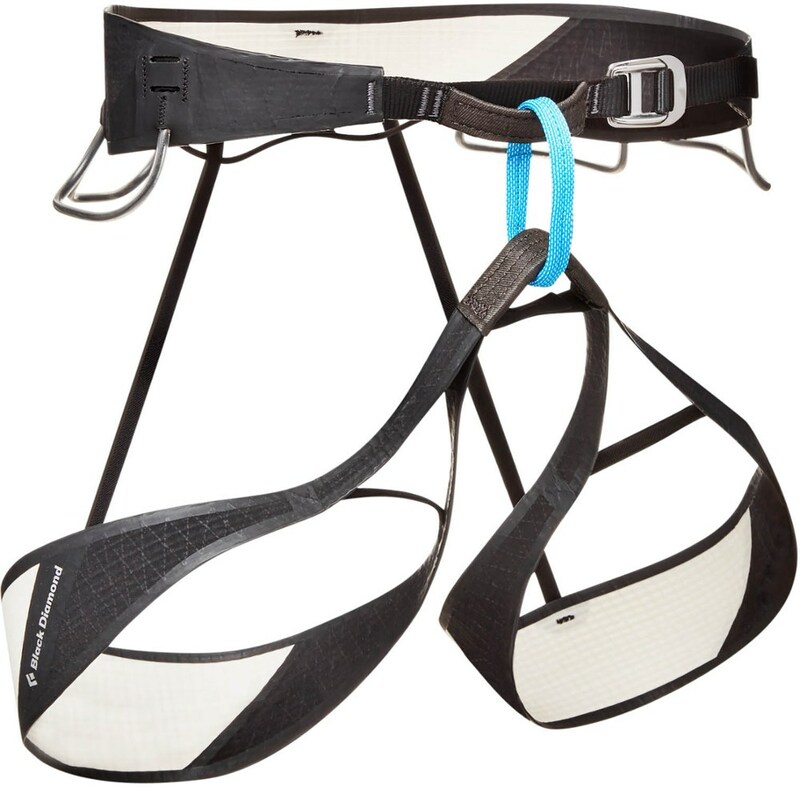 This one is my "Go-To" cave harness and is lower priced than the Cavemaster. The harnesses I bought was listed as a CMI. 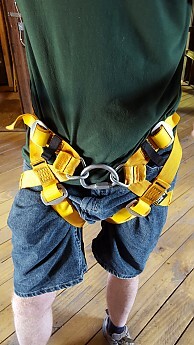 http://www.campsaver.com/digger-cave-harness?gclid=Cj0KEQiA2b20BRDj4buduIG-y9EBEiQAhgMGFXsuDK6Kfv1C36e7D4aUKl61iytTR3g2P1_f36UhV0IaAqmA8P8HAQ But you are right, the tag on it says "Singing Rock." I've owned this thing for nearly 2 years, and never noticed that the label reads Singing Rock. I'll flag this item for Alicia to move it to a Singing Rock listing.